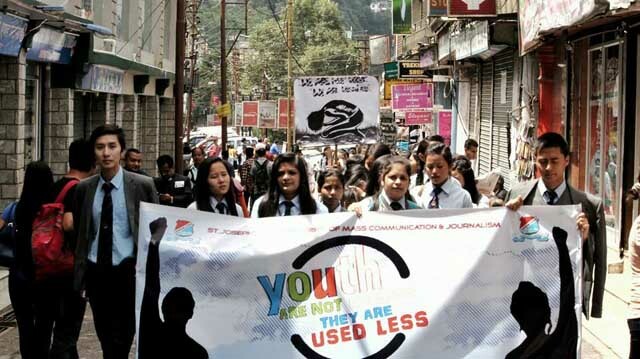 The department of Mass Communication and Journalism, St. Joseph's College organized a rally on youth empowerment from railway station which ended at Chowrasta to celebrate International Youth Day. A street play was also showcased by the students of the department at Chowrasta which talked about how the youth can bring in a positive change in our society. The theme for this year was : "Youth are not useless but they are used less." The Public Relation Campaign was initiated by the Department of Mass Communication and Journalism in the year 2014,to impart awareness on crucial topics like "Crimes against women" (The theme for last year, 2014.) and the like. The students even distributed stickers related to the theme, among the audience. "Our Youth are not failing the system,the system is failing our Youth. Ironically, the very young people will lead us out of this Nightmare - Rachel Jackson" read in one of the placards which was held by the participants. Other Social Organisations and NGOs were also invited to participate in this event.